I want to thank Torco for the excellent products they supply. I have decided to compete the ‘15, ‘16 and ‘17 seasons in my 6 time National Championship FP car. 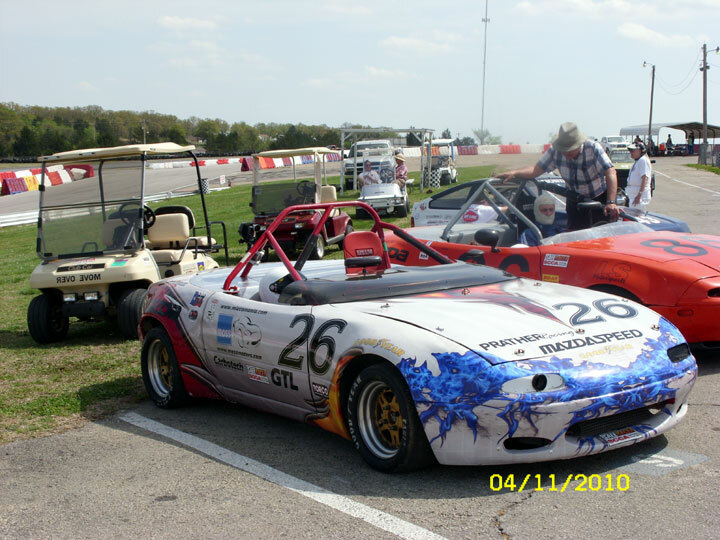 I won 2 additional Championships with my GTL Mazda Miata, but want to run the MGA. Torco oils have protected my engines to the point of never worrying about engine bearings at all. 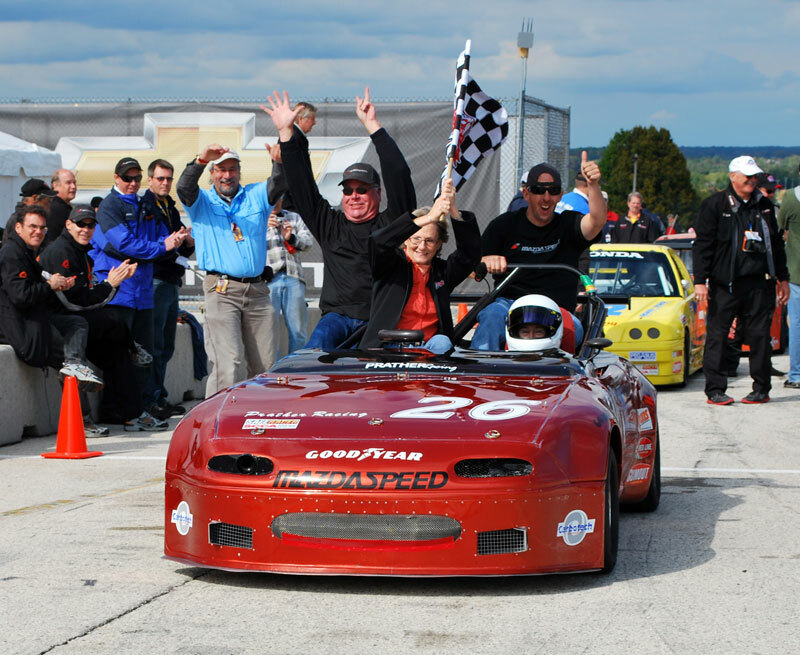 The Daytona SCCA National Championship race forced gearing and top end speeds of 144.2 mph and an rpm top of 7800!! The engine ran the first mile from turn 7 onto the back stretch and then the mile from the Bus stop turn to the start finish line at a sustained 7800 rpm for 45 minutes. No loss of oil pressure, no overheating. After the race and during the Winter I decided to look at bottom end bearings and simply reinstalled them. This is a engine put together in 2009!! Additionally the SGO rear end oil is superior to all rear end lubes we have ever seen or used as it does not even turn color over extended race intervals and we have seen major drops in gearbox oil temperatures using your product. Every racer we can influence we do!! 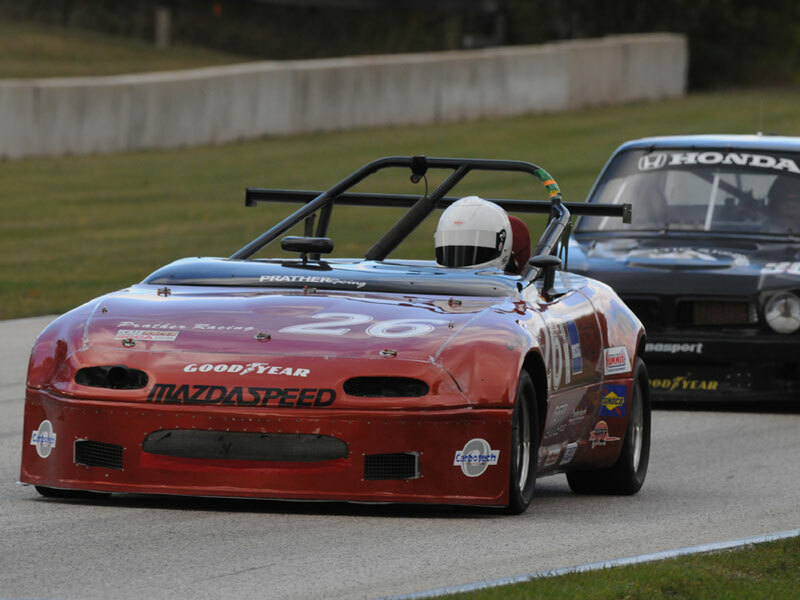 Kent Prather, of Wakarusa, Kan., successfully defended his GT-Lite National Championship in dramatic fashion at the 49th SCCA National Championship Runoffs® at Road America. Prather pulled alongside Robert Lentz, of Chantilly, Va., at the finish line to take the win by 0.023-second. James Hargrove, of Surrey, B.C., finished third. Mazda/Moss/Goodyear/Torco/Carbotech Mazda Miata held the lead to Turn Eight, where second-starting Lentz got by. Four turns later, Lentz spun and relinquished the lead to Prather as rain began to fall on the back half of the four-mile road course. On the following lap, Prather spun from the lead in Turn 13, handing the lead to Steve Sargis who drives the No. 18 SBS Batteries Hoosier Tire Triumph Spitfire. "I got back into Canada Corner on the second lap and I just turned to the right too hard," Prather, an eight-time National Champion, said. "I must have been in too low of a gear and I just spun around, but I was going the right direction… It was just a rookie mistake." Sargis and Hargrove exchanged the top spot several times until lap seven, when Sargis ran wide in Turn Three and slowed considerable on course, before exiting the track at Turn Five. Hargrove inherited the lead in his No. 38 RaceEnergy/Analytic Systems Honda Civic and, by this point, Prather had remarkably worked his way back to second. This commenced a fantastic duel between Hargrove and Prather that saw the two exchange the lead several times per lap. "The Honda was making very good power," Prather said. "I'd catch him pretty good in Turn One and Turn Three and I was able to go faster into Turn Five, but he could out brake me anywhere. If I went down on one side, he'd just go around me on the other side. It was a really good battle and I just knew that I had to somehow keep ahead of him." The battle for the lead enabled Lentz and his No. 60 FGR/Nissan/Goodyear Nissan Sentra SER to catch the dueling duo. Lentz set the Hawk Fastest Race Lap in the process, a 2:35.053 (92.871 mph). "I was trying to find the limit of the tires on every lap," Lentz said. "It was raining in a different corner every time. I was already spooked, but I kept my head down and drove it at the limit as hard as I could. Once I could see them [Prather and Hargrove] it was easier." On the penultimate lap, Hargrove made a costly passing attempt for the lead in Turn 14 that resulted in contact between his Honda and Lentz' Nissan. "Kent was coming in pretty wide," Hargrove recalled. "I figured he might have left the door open, so I stuck my nose in there and he closed the door. It was just racing. There was more than a little contact, but both cars (Hargrove's and Lentz') survived and kept going. Because I lost all the momentum when I hit, Bobby had to give me a shove up the straightaway." The loss in momentum enabled Lentz to draft past Hargrove for the runner-up spot and give chase to Prather. What seemed like a sizeable gap became dangerously close by Turn 12. Feeling the pressure, Prather slid wide and into the grass at Turn 14. He pulled back on track alongside Lentz and the two drag-raced up the hill. At the line it was Prather by 0.023-second, the third-closest finish in Runoffs history in the modern transponder era. "I think I've got to get the rookie book out again, because I'm pretty sure I looked in the mirror at the wrong time," Prather laughed. "All I know is I was going to get a really good run on him going into Turn 14 and he wasn't going to catch me. The next thing I know I'm off the track! I don't know what to say other than I missed my apex, but I never let off the gas. When I got back on the track I came on pretty close to him and usually I shift into fifth through there, but I kept it in fourth, because I knew if I shifted I'd lose just enough momentum. So I kept it in fourth and got him by a couple splitter lengths." A victim of the race's early rain shower, Lentz reminded himself to keep hitting his marks until the leaders came into view. His climb to the front of the pack earned him the GoPro Hero Move of the Race. "I had the same strategy as I did last year, which was 'attack as fast as possible,'" Lentz said. "I stuck with Kent through Turn Five and started attacking. I got a run on him in Turn Eight. We went barreling down into Canada Corner. I saw the debris flag and figured it must have been leftover stay-dry, because it was our first lap. After we were on the brakes, I could tell it was raining. I just lost it and looped it. I was really lucky, because my competitors took care of me and didn't take me out." While he prepared himself for a last ditch effort to pass Prather in the final corner, he couldn't have imagined it would finish as close as it did. "Two years ago, I was racing Peter Shadowen for third place and I was in fourth coming up to the last corner and he drove a defensive line and that gave me a run up the straight," Lentz said. "I was very focused on driving my line and trying to do the same thing on Kent. I was tickled when Kent took care of it himself and drove off the track! I must have lifted not knowing where he was going to go; it's obvious Kent didn't and that was the ball game." After blowing three motors in qualifying and enduring an up-all-night rebuild, Hargrove's Sunoco Hard Charger Award for coming from fifth to third was well deserved, especially considering his lengthy battle with Prather. "Kent's car was stronger in one part – he ran really well in a straight line," smiled Hargrove. "I could out-corner him. I could out-brake him, but if he was in front and took the line away, then I had to follow. He didn't give me many chances. I took the ones that were there and made some passes, but his car has an amazing motor and after we hit in Turn 14, that gave Bobby the chance to get a run on him, I was able to stay in Bobby's draft until the end, so I wasn't too far down on power, but just a little bit. Basically these guys had really good motors… Kent drove a great race and Bobby came back to us and I think all three of us had an absolute blast out there." Jonathan Goodale, of Conifer, Colo., finished fourth in the No. 04 Mazdaspeed/Hoosier/JoeApex.com Mazda MX-5. Peter Zekert, of Maryland Heights, Mo., was fifth in the No. 45 Wiseco Pistons/Redline/RKI Group Nissan 200SX SE-R.
Now in its 49th year, the SCCA National Championship Runoffs annually crowns Champions in the Sports Car Club of America's Club Racing classes. The live broadcast of all 28 National Championship races will be available through Sunday at www.SpeedcastTV.com/scca and later available On Demand from the same site. 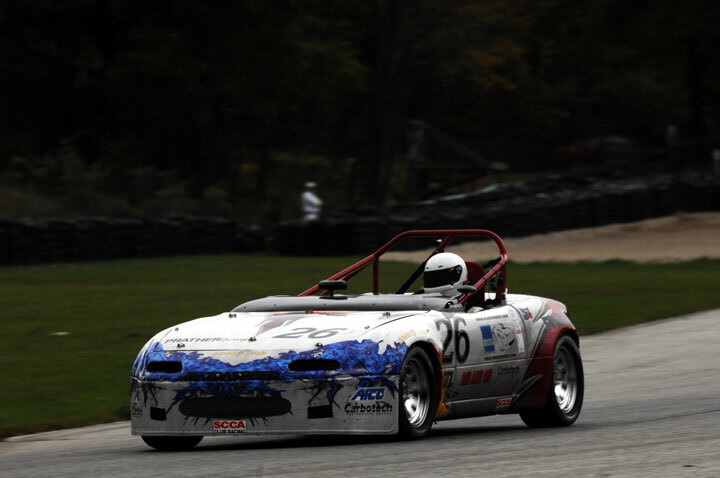 ELKHART LAKE, Wis. - Provisional Results from Saturday's GT-Lite National Championship Race, part of the 49th SCCA National Championship Runoffs at Road America with finish position, starting position in parenthesis, driver, hometown, car and laps complete. 1, (1), Kent Prather, Wakarusa, KS, Mazda Miata, 13. 2, (2), Robert Lentz, Chantilly, VA, Nissan Sentra SER, 13. 3, (5), James Hargrove, Surrey, BC, Honda Civic, 13. 4, (6), Jonathan Goodale, Conifer, CO, Mazda MX-5, 13. 5, (7), Peter Zekert, Maryland Heights, MO, Nissan 200SX SE-R, 13. 6, (8), Roy Lopshire Jr, Blue Springs, MO, Toyota Tercel, 13. 7, (4), Brian Downey, Bristow, VA, Nissan 200SX SE-R, 9. 8, (10), William Partridge, Mooresville, FL, Nissan Sentra, 7. 9, (3), Steve Sargis, Frankfort, IL, Triumph Spitfire, 6. DNF, (9), Kyle Disque, Philadelphia, PA, Toyota Tercel, 1. Kent has already participated in 2 SCCA Regional Events and won them both, he also set the track record at Hallett Raceway in OK this month. 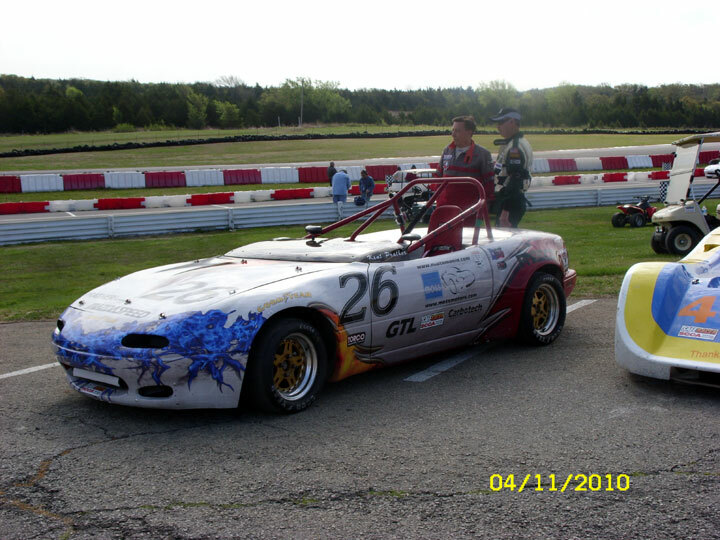 He will participate in 8 SCCA events and is guaranteed entry in the SCCA Runoffs/Nat'l Championships as he is current 2011 SCCA GTL Champion with the Mazda Miata. He will also do 3 large Vintage events with the FP MGA he won 5 of the Championships in. 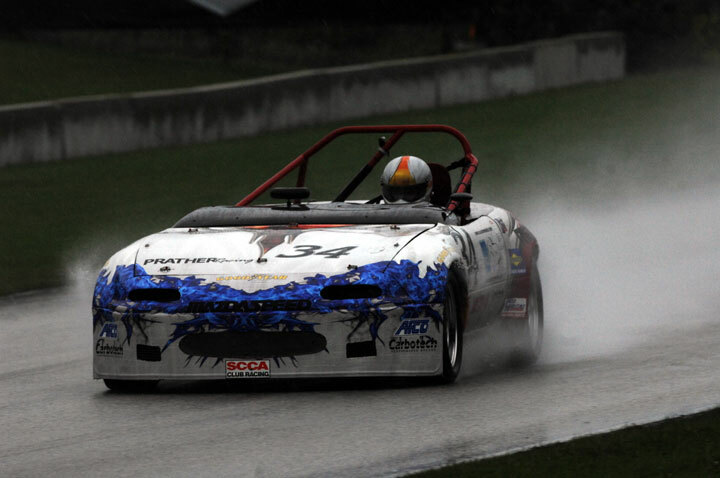 Seven-time National Champion Kent Prather, of Wakarusa, Kan., cruised to victory in the GT-Lite race during the 48th SCCA National Championship Runoffs at Road America. Peter Shadowen, of Riviera Beach, Fla., and Brian Downey, of Bristow, Va., joined Prather on the podium, respectively. Prather started from the Gumout pole in the No. 26 Prather Racing/Mazdaspeed/Moss Motorsports/Goodyear Mazda Miata and was side-by-side with Bobby Lentz, of Chantilly, Va., in the No. 60 FGR/Auto Expectations/Goodyear Nissan Sentra SER in Turn One at the race start. Coming out of Turn One, Lentz had the lead and held it for the first lap. Lentz had a transmission issue on lap two, which forced him out of the race. When Lentz pulled into pit lane, Prather inherited the race lead and continued to string together fast race laps. Prather turned the Hawk Fastest Race Lap of the race with a 2:35.100 (92.843 mph), opening up a lead of more than eight seconds over the field by lap six of the 13-lap race. Prather was never seriously challenge over the remaining seven laps and cruised to a 3.398-second win over the defending GT-Lite National Champion Shadowen. "My kid, Jesse, three-time National Champion, told me, 'Dad make sure you beat him [Lentz] into Turn One,'" Prather said. "So, I did. Then, Bobby got right up next to me. We went down into Turn Three and he was right next to me. We went down the straight into [Turn] 5 and I could see he was going to outbrake me. So, I let him go. Then, I decided this might not be so bad. I was drafting him on the back side and I thought I would just back off here and see what happens on the front straight. "We got going and then, I think it was the third lap, all of a sudden going into the Carousel, he missed a shift. Apparently, he broke his gear box. He pulled off, like the gentleman he is and I just took off. Then, that was that. I just started hitting my marks. It started to rain a little bit and I knew Peter [Shadowen] was coming because I could see the yellow [car] back there. My wife kept giving me my gap. It would be six [seconds], then it would be seven, then it would be six, then it would be five. I decided to stay off the paint, get down in the brake areas properly, hit my marks, and make sure he didn't catch me." Prather's car, which was a 185,000-mile street car before being converted into a racecar, has now won Championships in three different classes. Son Jesse Prather won three titles with the car – F Production in 2006 and 2007, E Production in 2008 and now GT-Lite with Kent behind the wheel in 2011. It was Prather's seventh National Championship. He is one of two drivers to win Championships at Road Atlanta, Mid-Ohio Sports Car Course and Road America, the other being Michael Lewis. Prather's previous six titles came in G Production, driving an MGA. Prather Racing would like to thank its sponsors for their continued support, including ARP, Carbotech, Goodyear Tires, Mazdaspeed, Moss Motors, Torco Advanced Lubricants, Total Seal Rings and Venolia Pistons. 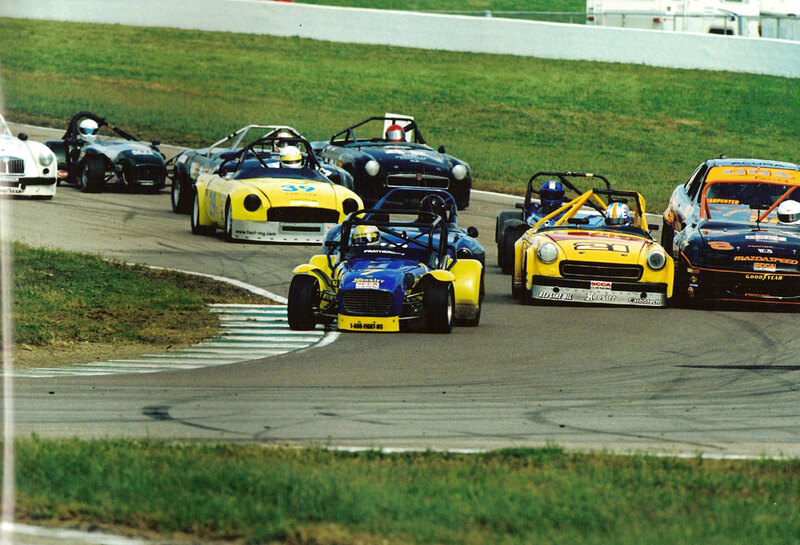 Now in its 48th year, the SCCA National Championship Runoffs annually crowns Champions in the Sports Car Club of America's Club Racing classes. The live broadcast of all 28 National Championship races will be available throughout the weekend at www.Speedcasttv.com/scca and later available On Demand from the same site. Image: Kent Prather takes a victory lap with crew (l-r) Robert Montgomery, Kathy Prather and Joey Smith. JENNINGS, OK (April 13, 2011) They call it the Super Tour—a collection of six SCCA National events across the country that have the spotlight of the Club Racing world shone upon them and the support of BFGoodrich Tires to provide additional incentive for racers to participate and win. 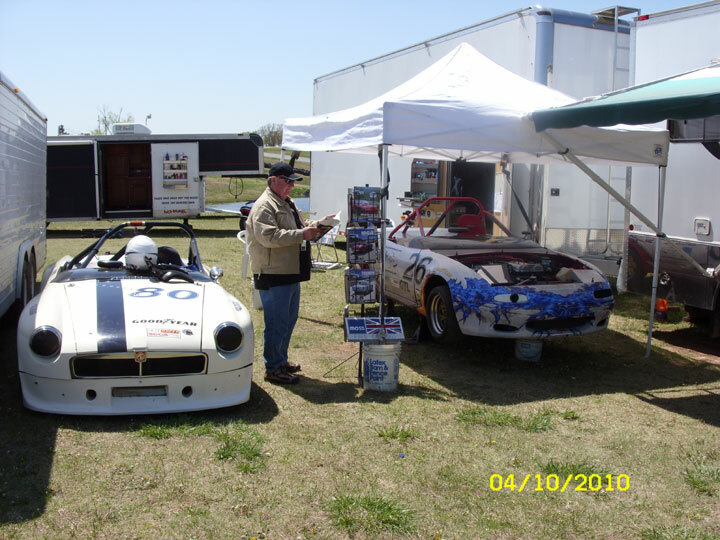 And Prather Racing did just that April 2-3 at Hallett Motor Racing Circuit in Oklahoma, winning E Production and GT-Lite. Prather Racing dusted off Ron Davis' F Production MGB for Jesse Prather to run in E Production, since his new MX-5 was not yet ready for the track. With a Super Tour-bolstered 13 cars entered in the race, it looked like a daunting task, particularly with fellow three-time National Champion Justin Pritchard entered in a Mazda RX-7 built to full E Production specs. Jesse qualified the car a respectable third, and after a handful of laps, was into the lead and speeding off to an overall victory in the "big bore" group, setting the race's fastest lap in the process. 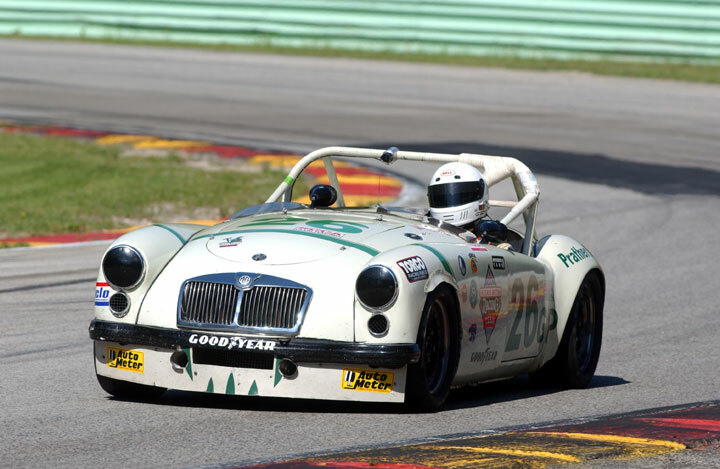 "Normally, I race Mazdas, but I really have to thank Prather Racing and Ron Davis for the opportunity to drive this MGB this weekend," Jesse said. "This is a great car and it's for sale!" Someone really needs to get their hands on this MGB. Ron Davis has retired as a driver and it is a no-expense spared build right out of Prather Racing. Check out the "for sale" page for details. It's a winner in either F Production or E Production trim. 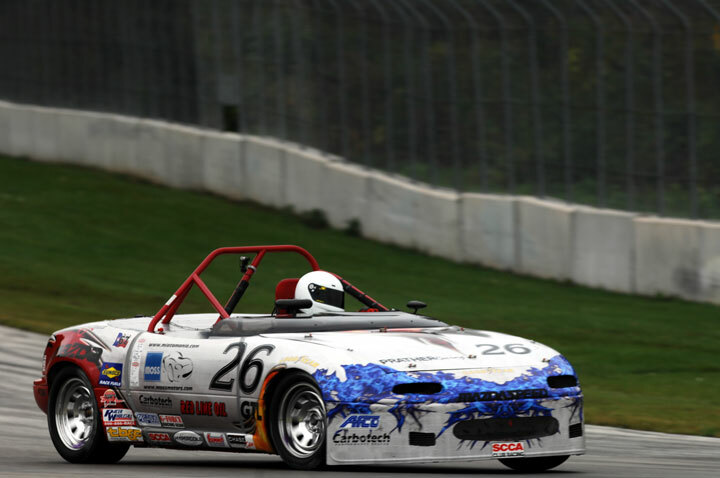 Three race groups later, Six-Time SCCA National Champion Kent Prather scored a flag-to-flag GT-Lite win in his recently bronzed #26 Prather Racing/Moss Motors/Goodyear Mazda Miata. Kent took the class pole by nearly five seconds and ran a steady race to take the win, finishing third overall. The race was won overall and in F Production by Rick Harris, who won the 2008 F Production National Championship with Prather Racing technical support. Like Jesse, Kent took the opportunity to stand atop the victory podium and spray the crowd with champagne. That's two races in-a-row (including the 2010 Runoffs) that Kent has sprayed the bubbly from the podium, and it looks promising to keep the streak alive throughout the season. At Prather Racing Inc., we specialize in performance and racing engines for MGA, MGB and Elva Courier cars.. Whether you need a bone-stock motor for your street car or a stage five racing engine, Prather Racing has the experience and knowledge to achieve your needs. We also have a large inventory of hard to find parts for MGAs and MGBs. At Prather Racing Inc., we pride ourselves in being very careful with the "little details" - manufacturing and assembly that goes beyond the standard engine, transmission or differential rebuild. Prather Racing uses a self-developed blueprint and engine build sheet for each job, regardless of the stage of the engine we are building. We have an extensive parts inventory of new and used parts. We have MGA and MGB blocks, crankshafts and cylinder heads for every model built - in stock! Therefore, we can use your parts, or supply them for you. Also, ask about our racecar service facility and in the Midwest. Engines are built based on your needs and expectations. We own our own shop, dynomometer and tools, so we are able to complete the building process from beginning to end. You will find that our advice and guidance go beyond the finished product. After that more powerful, high-revving engine comes off the dyno, we will advise you on how to jet the carbs or tune your engine management to achieve the new power we developed for you. How about increased cooling needs, fuel requirements, exhaust, etc.? You will always be able to reach Kent for advice and help. At Prather Racing, we build our Mazda engines for longevity and maximum horsepower. With numerous National wins under our belt, our customers know that they can rely on a Prather Racing-built Mazda engine to be fast all the way to the finish. Every engine is built to each customer's needs and budget restraints and individually tailored to fit their racing style. If you race a Miata, you're in luck. As the 2006 and 2007 F Production and 2008 E Production National Champions, we know how to get your Miata to the front of the pack. We have expanded our Miata program into GT-Lite and have done extensive, successful development with the SCCA Single Inlet Restrictor to maximize power. Our services include everything from engines and transmissions to engine management systems. Call today, and let's talk about improving your program.